Brachylophus fasciatus is an arboreal species of lizard. Sexually dimorphic, males have two or three blue bands 0.02m wide crossing their emerald green background with a pattern of spots and stripes on the nuchal region. Females are solid green with occasional spotting or partial bands. Both sexes have yellow-rimmed nostrils. Although there appear to be slight variations between insular populations, none have been well-described. The skin of Brachylophus fasciatus is sensitive to light and the lizard can change its skin color to match its background. Their long, spindly toes end in claws, and these help them to climb the trees that they live in. The cage size is 1 x 1.1 x 1.2 ( WxDxH) meters (3.2 x 3.6 x 3.9 feet). The cages are made so the iguanas have a big active surface( the active surface is the total amount of space the iguanas can physical use), It can be the bottom of the cage or the branches. To max out the active surface area, the cages are made with thin branches on the walls which give the iguanas the possibility to use all the walls to climb on. Branches are added in different sizes and angles all over the cages, and all have rough bark. The bottom of my cages are made with 4mm plastic sheets. This way I am sure no water will leak from the substrate and that the iguanas can’t destroy the bottom when they dig to lay their eggs. I use bio active substrate in my adult cages. The bio substrate is made of 50% forest floor and 50% compost. All the bugs that live in these two types of substrate are added to the cages, which mean that we have alot of different types of bugs in the substrate. In the substrate there are bugs like woodlice, springtails, earwigs, centipedes, millipedes and a few snails. The depth of the substrate is only about 0.15 m (0.5 feet), it is deep enough for the females to lay their eggs. I check the substrate once a week to see if water need to be added. I try to keep different levels of humidity in different areas of the substrate so that when the females are ready to lay eggs, they can choose what level of humidity is perfect for them. Same go for substrate temp. The temp in my substrate is 25-31 ºC (77-87 ºF) depending on where in the cage. All my cages has LED lights as main light. I use 2 x 14w for each cage, the color is 4200 kelvin which is a neutral white. Each light put out 1550 lumen. As basking spots I use 35w flood bulbs, they give a wider beam then a normal spot bulb, this way the iguanas can have there whole body under the light(without the tail), I use the 35w because I don’t need the basking bulb to heat the cages, it only has to create a basking spot. My basking spots are around 38-40 ºC (100-105 ºF) (temp is measured on the back of the iguana). All my iguanas are in the same room of the central heater for my house and it give enough heat into the room together with the cages to create a day temp of 28 ºC (82 ºF). At night the temp drop to about 23 ºC (73ºF) during summer, in winter the night temp drop to about 20 ºC (68 ºF). To mimic the natural light cycle on fiji, the cages have the main lights turned on for 11.5 hours a day. Basking lights turn on 1 hour later then the main light and turn off 2 hours before the main light. That way it create an “evening” and the iguanas will find there preferred sleeping areas. Fiji iguanas will drink water drops off standing leaves to obtain hydration. So as mentioned above using a misting system will keep your iguana hydrated. As for the humidity, I use a mist system. One spray head in each cage, and they mist every 6 hours for 15 sec. this together with the bio substrate make it possible to have a constant humidity around 75-80%. All my iguanas get fresh food every day, normally in the morning. Their food is mainly leafy greens like plantain and dandelion. A normal feeding contain about 10 different items, one of the items are normally some kind of fruit. They get so much food so a little is always left, that way im sure they get enough. 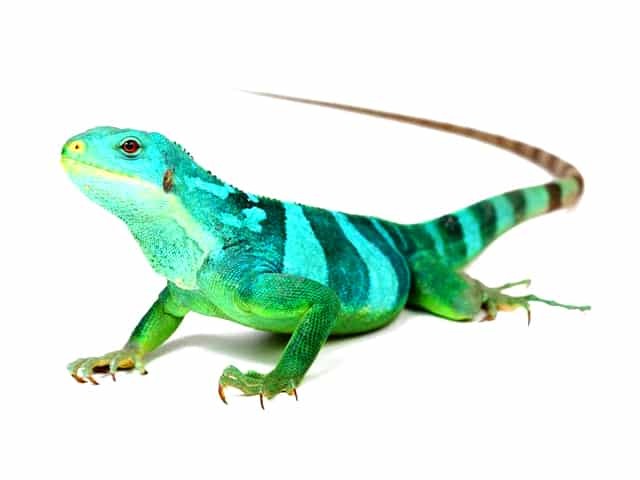 I do not normally feed insects to my adult iguanas, the reason why I don’t is that I have never seen any proof that fiji iguanas eat insects in the wild. But I have read documents and zoo info that say they are 100% herbivore. I do give my adults a dubia as a snack, it happens about once every 2 months. Females that have just laid eggs, I normally give a few dubias, and some water. As for my babies, they get insects about 1 time a week for the first 4-5 months. I do not use a supplement during the summer because the iguanas get everything they need from the plants I use for there food. During winter I use a mineral mix 1-2 times a week and a vitamin mix about 2 times a month. Also calcium powder is added 2-3 times a week since it can be hard for me to find calcium rich plants in the stores near me. Here is a list of plants and fruits I use for my iguanas. I work to gain the trust of my iguanas, because it makes a lot easier if I need to check a wound or something on them, and do stuff in their cages. The way I gain trust is very simple. Ofcourse most of my iguanas love dubias, so feeding them the rare treat with a tweezer is a nice way to start, but also fruit can be used (I use fruit normally). I slowly start making them come closer to me and I will use my other hand as a “platform”for them to walk onto when they start trusting me. They will slowly become more bold and come closer, and in the end they wont have a problem with me picking of a piece of skin and stuff like. It can take a long time to gain their trust, but its worth it in the end. If you are using the Bio-active substrate the only thing you have to do is spot cleaning. The most common reason for shedding problems is too low humidity. Humidity should stay around 70-80%. Sometimes the humidity is not enough, so it can be helped with a spray bottle. Spray the iguana carefully to soak the skin it has problem shedding. I’m not a fan of giving them a bath, since it often stresses them, so the spray bottle is in my opinion a better solution. The most common cause of MBD is from a imbalance in the levels of calcium, phosphorous, and vitamin D in their bodies. The symptoms are often limping, bowed legs, hard lumps along the legs, spinal column, jaw softening and unusual flexibility of the lower jaw, difficulty raising the body off the ground and decreased appetite. If caught and identified in the early stages, MBD is easy to treat. Wounds sometime occurs when Fijian iguanas are kept in pairs( specially in mating attempts). Females can often get wounds on the front legs or in there neck from the mating attempts, these can be flesh wounds. it is important to keep an eye on the wounds to make sure they don’t get infected.